3. Why use a wiki? 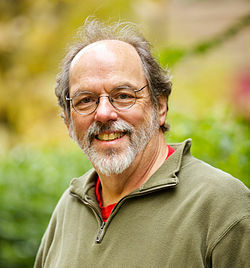 The name “wiki” was chosen by Ward Cunningham — the creator of the first wiki. 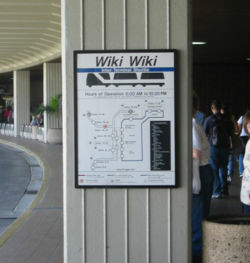 It is a shortened form of “wiki-wiki”, the Hawaiian word for quick. A wiki is a web site that is generally editable by anyone with a computing device, a web browser, and an internet connection. Wikis use a quick and easy syntax to allow users to apply formatting to text and create links between pages. This simple formatting syntax means that authors no longer need to learn the complexities of HTML to create content on the web. The main strength of a wiki is that it gives people the ability to work collaboratively on the same document. The only software you need is an Internet browser. Consequently, wikis are used for a variety of purposes. If you make a mistake, it’s easy to revert back to an earlier version of the document. The wiki is the preferred tool for collaborative authoring of OER courses for the OERu. Anyone who sets themselves up with an account can edit. Wikis are instantaneous so there is no need to wait for a publisher to create a new edition or update information. People located in different parts of the world can work on the same document. The wiki software keeps track of every edit made and it’s a simple process to revert back to a previous version of an article. Wikis are not difficult to learn and use once you understand how they are different to the tools you may already be famililar with. Widens access to the power of web publishing to non-technical users. The wiki has no predetermined structure – consequently it is a flexible tool which can be used for a wide range of applications. There are a wide range of open source software wiki’s to choose from so licensing costs shouldn’t be a barrier to installing an institutional wiki. Advantages in one context, may be disadvantages in another. Anyone can edit so this may be too open for some applications, for example confidential documentation. However it is possible to regulate user access. Open to SPAM and vandalism if not managed properly. There are easy ways to restore a page however, and on WikiEducator you must be logged in to edit pages so this reduces vandalism by automated spam bots. The community monitors and deletes any spam postings. Requires Internet connectivity to collaborate, but there are technologies to produce print versions of wiki pages. The flexibility of a wiki’s structure can mean that information becomes disorganised. As a wiki grows, the community plans and administers the structure collaboratively. Let us know what you think by posting on WEnotes below, OERu forums or Twitter. Do any of the advantages lend themselves to open design? Do you find any of the disadvantages particularly problematic for OER development? How does your own experience in using wiki’s compare? Any other thoughts worth sharing? You must be logged in to post to WEnotes.